IFR/San Antonio FrontRunners/ Diablos FrontRunners are all interchangeable names. We remain an autonomous LGBTQ straight friendly Run/Walk group bound by Diablos OutSports Association bylaws. We currently meet twice a week. Sundays at 9:00 am at the south end parking lot of Brackenridge Park Golf Course/ or at Blue Star Arts Complex parking lot at the Probandt entrance, and Wednesdays at 6:30 pm the Pearl amphitheater in front of the restrooms. As we increase in membership opportunities to train for 5K, 10K, a 1/2 Marathon and Marathon will become available. We also have a unique opportunity to volunteer in community outreach programs. Details to follow. By liking us on Facebook or as a member under Diablos FrontRunners you will be receiving weekly notifications of meeting times and places. 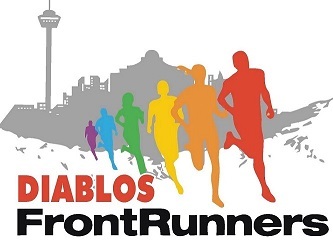 Exciting new things are about to happen, register to Diablos FrontRunners!